Three on Thursday | About Our Parallelogram KAL. Thing One – We’re casting on this coming Saturday, January 20 … and there’s no end date. Thing Two – Please join us!! Use the tag #ParallelogramKAL on Instagram so we can all follow along. 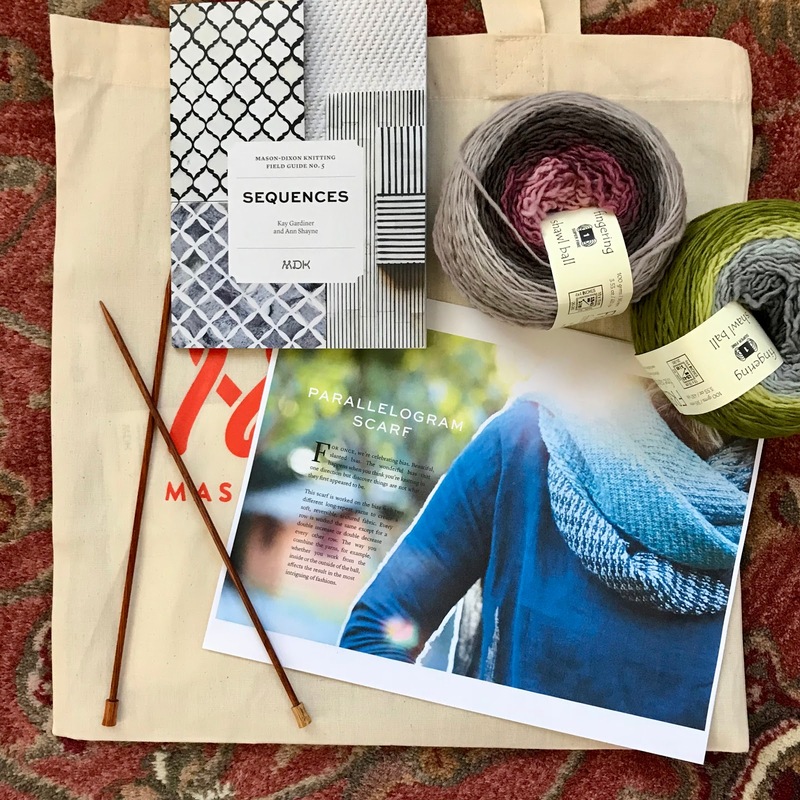 Thing Three – My yarn is wound (ha, it came that way 😁 – I ordered the Freia Handpaints Kit from Mason-Dixon last November; the gray with purple inside is Vintage and the green with gray inside is Lichen) and I have my needles (surely 100 stitches will fit on those size 5 straights?). I’m not planning to swatch. In other words, I’m ready! Questions? Please leave a comment and I’ll do my best to answer. For more ToT posts, check out Carole’s blog. Happy Thursday! One Word Wednesday | Pink. Tell me more. Is the yarn held double or is it a really big scarf? I really want to play along biput not sure if I can get that yarn. I considered joining you as I love the way the colors play and I was also enticed by Vicki's colors (and yarn), but I know I just won't be able to keep up! However, I am still tempted. I'm anxious to see how your yarns play together, and Vicki's hand-dyed beauties also! I keep looking at this pattern—its super tempting. So tempting, but so many other things going on. The yarns are beautiful. Will be fun to see your progress. I won't be joining but I will be cheering you on from the sidelines! Like Carole, I'm part of your official cheerleading squad! Go, Knitters! Go!!!!!!! looks like a very fun knit!! have fun! I am still pondering…but I love your yarn! I just love your photo!! I'm so excited to cast on and can't wait to see how it all happens. That Sequences book is probably my favorite Field Guide (so far!) — so many great projects. Look forward to seeing how this progresses-maybe the next KAL I'll join along.